Home > Dogs and Cats>Dogs>Health and Hygiene>Hygiene for your dog>CURTIVET 125 ML, Lotion for the protection and care of the pads of the dogs. 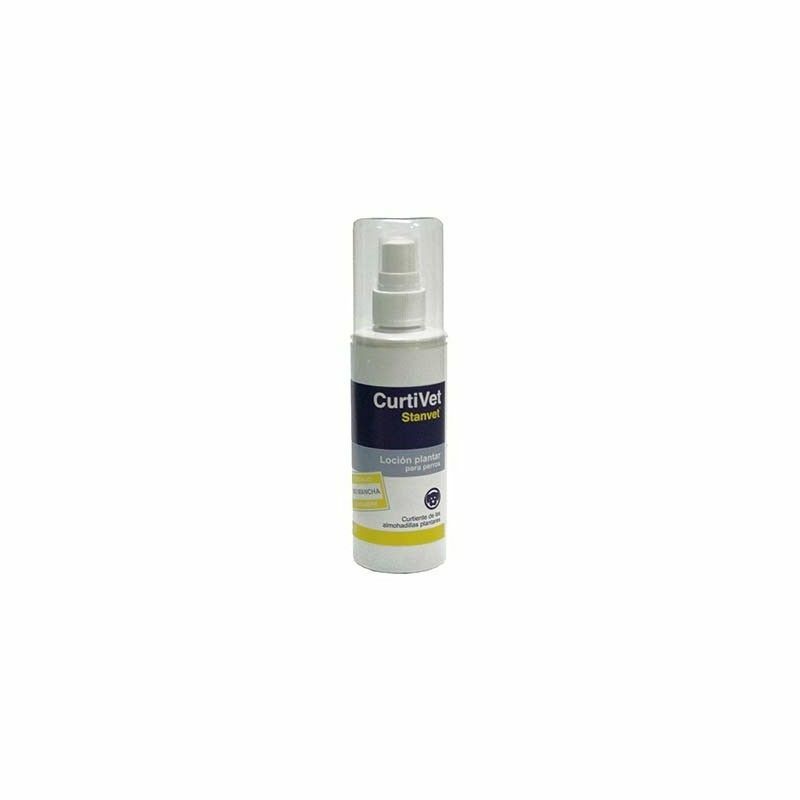 CURTIVET 125 ML, Lotion for the protection and care of the pads of the dogs. Lotion for the protection and care of the pads of the dogs. The pads are formed by a thick layer of skin and fat deposits, which protect against abrasions, dampen the impact received by the joints and prevent bumps and damage bone. Even if they are resistant zones, front to certain conditions very xigentes, can dry out, crack or even bleed. The pads are formed by a thick layer of skin and fat deposits, which protect against abrasions, dampen the impact received by the joints and prevent bumps and damage bone. Even if they are resistant zones, front to certain conditions very xigentes, can dry out, crack or even bleed. Therefore, it is necessary to take care and protect the foot pads to prevent injuries. CurtiVet lotion is plant is particularly suitable for dogs who are very active, undergoing intense exercise, or walk on demanding terrain, or abrasive surfaces, such as asphalt or snow. 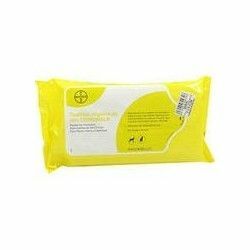 It is also indicated for dogs with pads that are sensitive or damaged. The new formulation incorporates Urea and MSM, two keratolytic agents key to the maintenance of the skin. It is user-friendly and practical: easy-on spray, does not stain and dries fast. Glycerin: 40%, Urea: 5 %, Dimethyl sulfone (MSM): 3 %, Extract of Centella asiatica: 3 %, Extract of Aloe barbadensis (Aloe vera): 0.3 %, Extract of Thymus vulgaris (Thyme): 0.3%, preservatives and excipients. 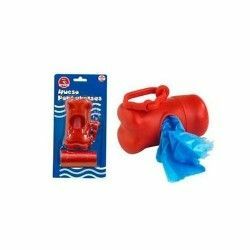 Spray the pads at a distance of a few centimeters. As a preventative, apply every 2 days for three weeks before the season of most activity. During the season, use every three days. In pads irritated, apply once a day for two weeks. Glycerin is a moisturizing agent that keeps the moisture away from the skin and prevents the appearance of cracks. Urea has keratolytic activity, moisturizing and exfoliating, which helps to keep in balance the cellular layers of the pads, providing flexibility and resistance. The MSM is a sulfur source that is bio-available, essential for the maintenance of connective tissue, with properties queratolíticas and healing properties. • Centella asiatica rich in asiaticoside, a compound that helps to repair the tissue injury and healing. • For its anti-inflammatory activity and antiseptic, Aloe vera promotes regeneration of the injured skin. With a high capacity of hydration of the layers of the skin. • The extract of Thyme has well-known antibacterial activity and offers protection against infections. Thanks to this formulation, CurtiVet hardens the keratin, increases rub resistance, and helps to repair the lesions in the foot pads. 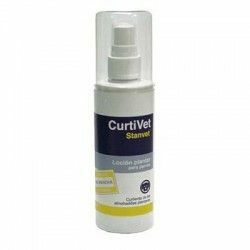 Product Name:CURTIVET 125 ML, Lotion for the protection and care of the pads of the dogs. Description: Lotion for the protection and care of the pads of the dogs. The pads are formed by a thick layer of skin and fat deposits, which protect against abrasions, dampen the impact received by the joints and prevent bumps and damage bone. Even if they are resistant zones, front to certain conditions very xigentes, can dry out, crack or even bleed. Path: Home > Dogs and Cats > Dogs > Health and Hygiene > Hygiene for your dog > CURTIVET 125 ML, Lotion for the protection and care of the pads of the dogs.